The Cowell Coffee Shop for the Peoples—an innovative nontransactional food store and cafe designed to address food access issues for the student population—is open for business. Celebrating its grand opening on November 7, the cafe located at Cowell College will offer free coffee, prepared meals, a juicing station and pastries—all intended to provide low income students with healthy options and alleviate stressors related to feeding themselves, which can ultimately have detrimental effects on their academic pursuits. Because of the meteoric housing costs in Santa Cruz, students living both off and on campus need about $34,000 per year. Some students attempting to get by with less will make cuts in their food budget. Brenda Walker, a third-year student at Stevenson College, knows about the struggle with food insecurity and its impact on her studies first hand. For Galarneau this experience typifies that of at least 2,000 UC Santa Cruz students who experience food insecurity. Galarneau and others participated in the 2016 Global Food Initiative—a survey of approximately 63,000 students across the UC system, which found that 44 percent of undergraduates and 26 percent of graduate students had experienced food insecurity at some point during their collegiate stint. Specific to UCSC, the initiative interviewed 605 students and found that 57 percent reporting experiencing low and very low food security, which includes running out of food, skipping meals, and eating less than required due to financial pressures. “While we cannot solve structural inequality in the UC alone, we can introduce interventions that support greater student food security and success,” Galarneau said. Enter the Cowell Coffee Shop. The shop, along with giving students access to meals and pastries, also runs workshops about food preparation, knife use, and other skills necessary for students to feed themselves as many of them grapple with the experience of being on their own for the first time. 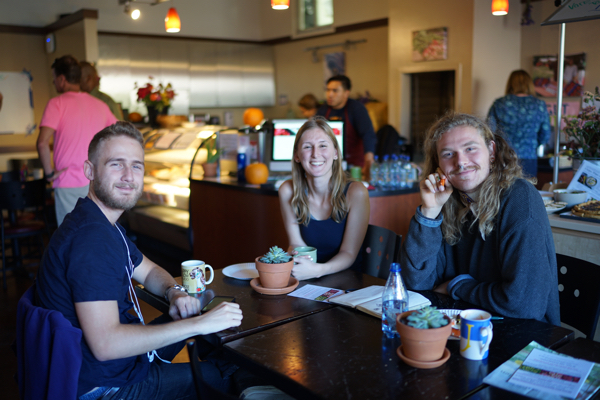 The cafe is 100 percent student run, with 12 students taking part of the leadership team, while four others develop the programing which includes workshops but also links to financial aid, housing help and statewide programs like CalFresh. Brenda Walker, a member of the leadership team, said one of the most effective aspects of the coffee shop is how it does not require students to sign up or qualify to use the cafe, saying such requirements often carry a stigma that can chase students away. “There is this whole idea of welfare queens, particularly as it applies to people of color,” Walker said. For the coffee shop, students simply have to swipe their ID card, which also helps Galarneau and others compile statistics regarding the who uses the cafe, how often and other similar metrics that can help the administration better tailor their services to a dynamic student population. “That aggregated data can help us understand who’s eating at the cafe and understand ways in which the students are using this space,” Galarneau said. The cafe is also partnering with the Dean of Students Slug Support food pantry to make sure that students not only have access to meals, coffee, tea and pastries through the cafe, but can find canned goods and fresh organic, student grown produce from the CASFS farm to take back to on- or off-campus housing. Much of the produce is provided by UC Farm and Garden and the Second Harvest Food Bank provides much of the canned goods and other items available at both the cafe and the pantry. “We want to let people know that access to food and access to good quality food is a basic human right,” said Walker.